Our friend Chris Pirillo received the “ultimate” collectible for any Darth Vader fan. 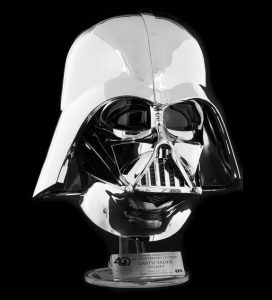 He was selected to receive a copy of the new Darth Vader Helmet (Melted) from Propshop and Lucasfilm and provided a complete unboxing video via his YouTube channel. Check it out above! Adam Savage (Mythbusters/Tested) adds a new prop replica to his collection: Kylo Ren’s helmet from Star Wars: The Force Awakens! This is actually Adam’s second Kylo Ren helmet–he has a modified Black Series Voice Changer helmet and now this high-end model by Prop Shop. We examine the prop to admire its fabrication and detail. 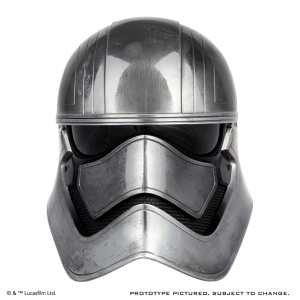 Anovos is now taking preorders for their Captain Phasma Helmet Premier Line Accessory. Order between now and January 31 to receive Tier 1 pricing at $679.00. 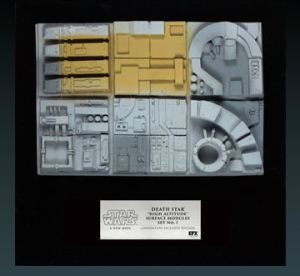 eFX Collectibles is now taking preorders for their Convention Exclusive Death Star “High Altitude” Surface Modules Set 1. Retail price is $149.00 and ships free within the continental US. The Empire needs loyal officers to maintain peace and order through the galaxy! A pre-requisite for this task is the proper uniform — and for that, you may look no further than our Premier Line Imperial Officer Offerings! Available in Officer Olive or Staff Black, the Premier Line Imperial Officer Uniform Package comes with the distinctive officer cap, jacket, and Jodphur-style pant, all being made from specially-dyed military-grade cavalry twill wool, replicated from the same fabrics used for the original uniforms. Our friends at JediNews have alerted us that the Star Wars: The Force Unleashed Incinerator Trooper PCR Helmet is now available exclusively via Cozmic Toyz and Elite Collectibles Inc. (via Amazon, and eBay). It retails for $199.99 and is limited to 501 pieces worldwide. StarWarsShop has put the Sandtrooper Helmet Precision Cast Replica up for pre-order. Limited to 1000 pieces – ships January 2011. Our friends at Yoda’s News have posted a first look of the new Count Dooku eFX Precision Cast Replica Lightsaber over on their YouTube page. Give it a look.